If you’ve been to a wedding (or logged onto Pinterest) in the last two years, there’s a solid chance you witnessed one or more of the following trends. Mason jar cocktails, a donut wall, and of course, the custom Snapchat geofilter. Have you ever wondered exactly how that Snapchat geofilter came to be? Well, it’s actually pretty simple. What’s even better is that you can make one yourself in a matter of minutes. That’s right! You may know how to use snapchat, but did you know you can make a custom Snapchat geofilter to fit your personal needs and goals? I’m going to walk you through the process step-by-step. Go to create.snapchat.com and click on "Create Filter"
Why make a Snapchat geofilter? Before we get started on how to make a Snapchat geofilter, let’s get you some background knowledge on Snapchat filters. First, we’ll cover the basics, like what a Snapchat geofilter is, why you may want one, and more. First things first, what exactly is a Snapchat geofilter? As a reminder, a Snapchat filter is a design that you can overlay onto a Snapchat photo you take. With that, a geofilter is just like a normal Snapchat filter, except it’s geographically based. That means that a geofilter is only available in a particular, designated location. Users can add these Snapchat geofilters to any picture they take. Often, I see them added to Snapchat stories. These geofilters, which were originally only available through a controlled application process by Snapchat, opened up to the general public in 2015. Starting then, anybody could create and upload a custom Snapchat filter to an area of their choice. While there is still a short approval process, these filters are, in general, cost-efficient and widely available. And when I say widely available, I mean very widely available. Since 2015, Snapchat geofilters have absolutely taken off in popularity. Want proof? Take a look at all of the Snapchat geofilters I have just sitting in my office. You’ll notice that the above Snapchat geofilters all reflect the particular neighborhood I'm in – that’s a pretty common use case. Nearly all of Chicago’s neighborhoods have a variety of unique geofilters. What is a Sponsored Geofilter? Sponsored Geofilters are custom overlays that can by applied to private pictures and videos sent from Snapchat users. They can be target to specific areas (such as proximity to stores) or can be across large areas. Sponsored filters are mostly leveraged by large brands, as they can be quite expensive. On-Demand Geofilters are similar to Sponsored Geofilters, but much more affordable and are used is very small, localized areas. These filters can cost as little as $5 an hour, and are perfect for small-business conferences, weddings, birthday parties, or event. Now that we know what a Snapchat geofilter is – and have seen some examples – let’s talk about the why. So now that you know what a Snapchat geofilter is, it begs the question: why? The simple answer is this. It will put your message, whatever it may be, in front of a lot of people. For example, think about all of the geofilters I see, just on a typical workday. 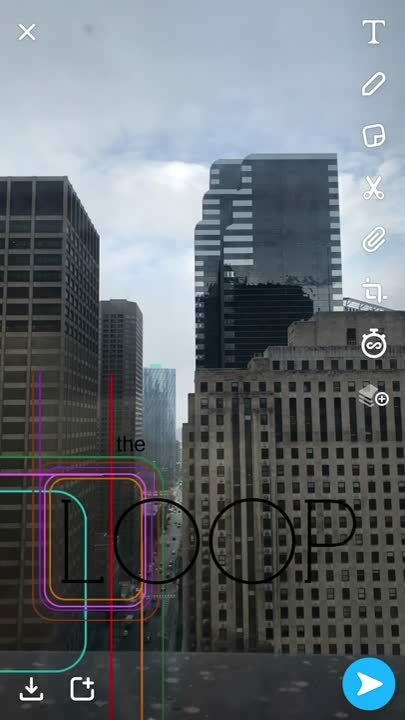 Granted, I live in Chicago (so there are probably more geofilters than say, a rural location), but, Snapchat geofilters are usually plentiful. And believe it or not, these are just scraping the surface! You’ll notice the above geofilters are mostly based on my location. However, they’re increasingly popular among bars, public attractions (think museums, landmarks), restaurants, and businesses (can you really call yourself a tech startup if you don't have a custom geofilter that covers your office?). Additionally, since Snapchat geofilters have opened up to the general public, they’ve become a staple at weddings, family reunions, college sporting events, and basically, any event at which you can expect a large crowd. The point is, nobody has to seek out a geofilter. As long as they’re in a particular location (and have their phone’s location services enabled), it’ll immediately appear in their Snapchat app. Needless to say, it’s a stellar opportunity for social media marketing, especially if you're looking to use Snapchat for business. They’re an attention-grabbing, cost-effective, and most importantly, simple way to get your brand out in the public eye. Almost more importantly is that we know consumers love them. Okay – maybe I’m looking at the small sample size of my Snapchat friends, but it’s a rare moment that I receive a Snapchat without a geofilter attached. 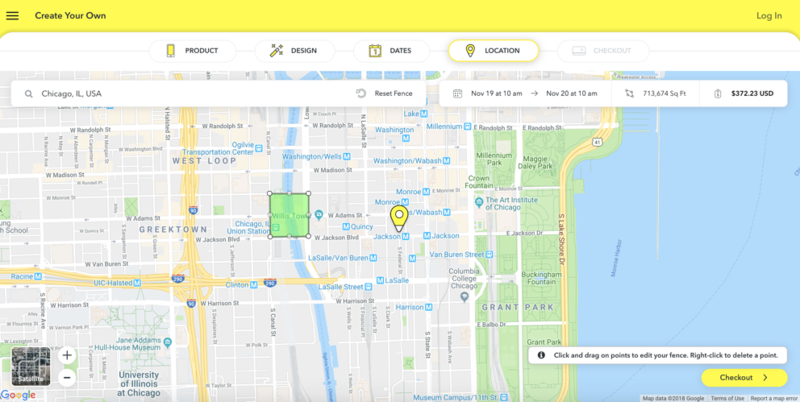 If you’re getting ready to create your own Snapchat geofilter, but want to get some inspiration first, here’s how you can view available geofilters. Viewing available Snapchat geofilters is easy, but first, you have to make sure that your phone’s location services are on. Once your location services are enabled, open up your Snapchat app and snap a picture! From there, simply swipe to the left or right to check out the available geofilters. 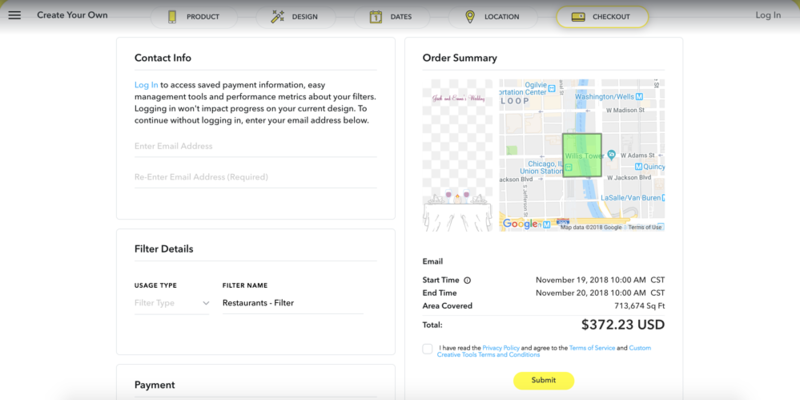 To upload your own design that you made in Adobe Photoshop, Adobe Illustrator, or any other design tool, click on the yellow “Upload” button in the top left corner. Keep in mind, your design needs to be a PNG file that is 1090px wide by 1920px tall, under 300KB, and have a transparent background. 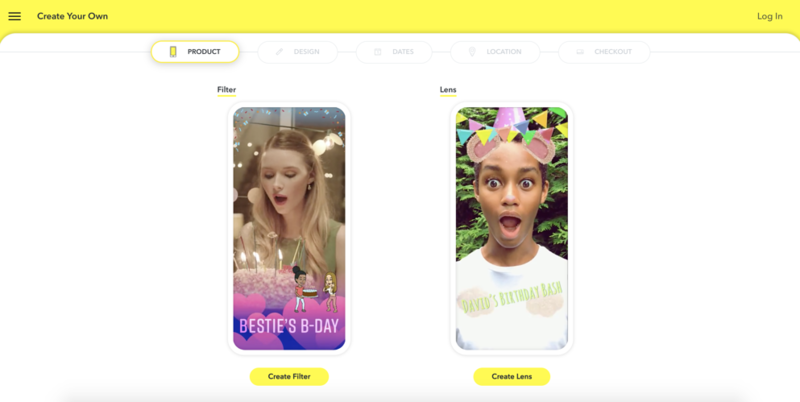 To design your filter on Snapchat’s website, simply use the provided tool. You can use the drop-down menu on the left side of the screen to select the occasion you’re celebrating, add your own text in different colors, fonts, and sizes, and more! Don’t forget! Your Snapchat filter can’t contain information like URLs or social media handles. 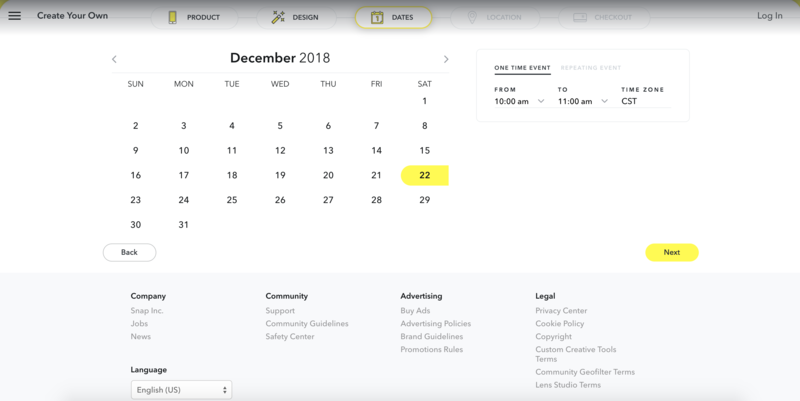 To select the days, use the calendar on the left side of the screen and choose your desired start and end date. To select the time, use the tool on the right and select your start and end time for each day that your Snapchat filter is live. To select your specific area, use the “Draw Fence” tool and draw a circle around your desired space. Completing this step will also give you the price of your custom Snapchat geofilter, based on your dates, times, and desired location. 4. Check out and secure your filter! To check out, simply fill out the empty fields (contact information, email address, filter type), and enter your payment information. When you click submit, you’ll be all set! Look out for a confirmation email in the coming days after. This process may take up to a week, so plan accordingly! What is a Snapchat community filter? Snapchat geofilter files should be 1080px wide and 2340px tall. No important text or elements should be included within the buffer zone (the area that may get cut off depending on the size of the phone screen), which is 210 px from the top and bottom. Files are required to be under 300KB and in .PNG format with transparency enabled. This is a loaded question. To put it simply, it depends on two factors: the size of the location you want to cover and the amount of time you want your Snapchat geofilter to be accessible. As expected, the larger your location is, the more expensive your Snapchat geofilter will be. Similarly, the longer it’s accessible, the more it’s going to cost you. Now, before you get too excited and start designing your new Snapchat geofilter, let’s cover the dimensions, specs, and of course, guidelines. As expected, the artwork submitted needs to be 100 percent original. Anything that they suspect may violate a copyright infringement will likely be denied – or at least, investigated. And yes – this does include logos and trademarks (except for college and university logos submitted by authorized officials). The artwork also has to be just that – artwork. No photographs will be accepted. Requiring original artwork also ensures that it can be catered to Snapchat’s dimensions. Basically, the filter shouldn’t cover too much of the phone screen as to not negatively affect user experience. As for the included text, it can’t include any phone numbers, social media tags, or hashtags. Are you ready to create your own Snapchat geofilter? We hope so! To learn even more about Snapchat, check out these additional resources. How to unlock Snapchat trophies in 2019!